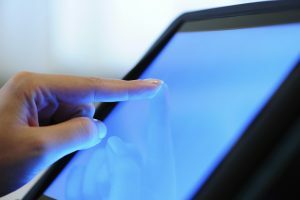 Here are five tips on how to create more engaging touchscreen content. If you have any more tips leave them in the comments below. Give your audience options. Everyone learns differently. Allow your audience to pick the kind of content they want by offering it in photos, video, and text. Encourage exploration. Consumers don’t need to be spoon-fed. They actually want to do some of the work themselves. Add buttons and functions that let people touch their way through your content in a way that lets them feel they are in control of their experience. Enable digital manipulation. Provide navigation arrows on photos and other content that let your audience rotate images, zoom in and out, and pan to different areas. This mental manipulation mimics that of real manipulation which leads to greater psychological ownership. Make your content richer. Experiment with different content designed for an engaging touchscreen experience like photo galleries, videos and soundtracks. Let your audience talk back. Add elements that let your audience tell you how they’re feeling about your content: “Like” buttons, “favorite” hearts, mini polls and comment boxes are a great form of emotional engagement, especially through a touchscreen.